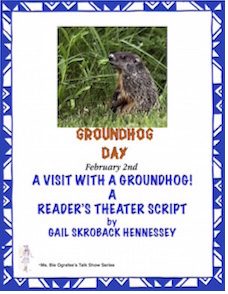 Home >> Blog >> Are YOU Ready for Groundhog Day: Share with your Students! Are YOU Ready for Groundhog Day: Share with your Students! Groundhog Day is February 2nd. It's a time when people look to a groundhog to find out whether or not we will be having six more weeks of winter. The idea dates back hundreds of years when people looked to hibernating animals such as badgers, hedgehogs and bears to see when they might wake up from their winter sleep. According to the tradition, if the animals saw its shadow, winter would last several more weeks. If it didn't see it's shadow, spring would be soon arriving. When Europeans, especially the Germans, came to the United States, they brought the tradition. The groundhog became the animals of choice as it hibernated and looked something like the European hedgehog. Groundhog Day started back in the 1880s with the first official celebration on February 2, 1887. The most famous groundhog weather forecaster is Punxsutawney Phil, of Punxsutawney, PA. On February 2nd, Punxsutawney Phil , who lives at the Punxsutawney Library is taken to Gobbler Knob and placed in a heated burrow underneath a simulated tree stump on the stage near where hundreds have gathered. At 7:25 if Punxsutawney Phil comes out to make his weather prediction. If he sees his shadow, there will be six more weeks of winter. If he doesn't see his shadow, spring is on its way! 2. Groundhog day is also celebrated in Canada on Feb. They have several weather forecasting groundhogs including Wiarton Willy, Shubenacadie Sam and Balzac Billy. 3. Did you know that Groundhog Day is an official university holiday at the University of Dallas(Irving, TX)? Celebrations are held in honor of the groundhog. 4. The very first mention of a Groundhog Day in the United States was found in a diary entry of James Morris. The year was 1841. 1.Pretend you are a weather forecasting groundhog. Tell about your big day. What did you hear? What did you see? How did you feel being in the limelight? 2.Learn about the country of Germany: Write 5 interesting facts you learned about the country. Hope you find my postings of value to use with your students. Always happy to hear feedback!